Model Natalia Kozhenova consumed by FIFA fever. Italian-Ukrainian model Natalia Kozhenova is enjoying the FIFA 2014 fever. 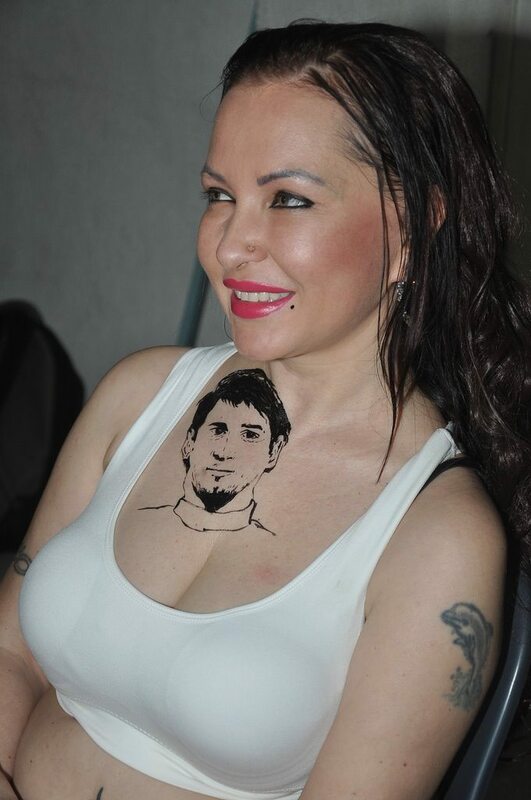 The model got a tattoo of the Argentinian footballer Lionel Messi on her chest. Natalia expressed that she wants Argentina to lift the FIFA World Cup, 2014. The model recently said that she is a big fan of soccer and supports Argentina, especially Messi. Natalia added that Messi is an exciting player and loves to watch him in action. The beautiful lady posed with a football and looked athletic in a pair of denim shorts and a white top. The actress was last seen in the Bollywood movie ‘Supermodel’ which starred Veena Malik and Ashmit Patel and hit the theaters on September 27, 2013.